All About Bugs: Native Praying Mantises on the Way? 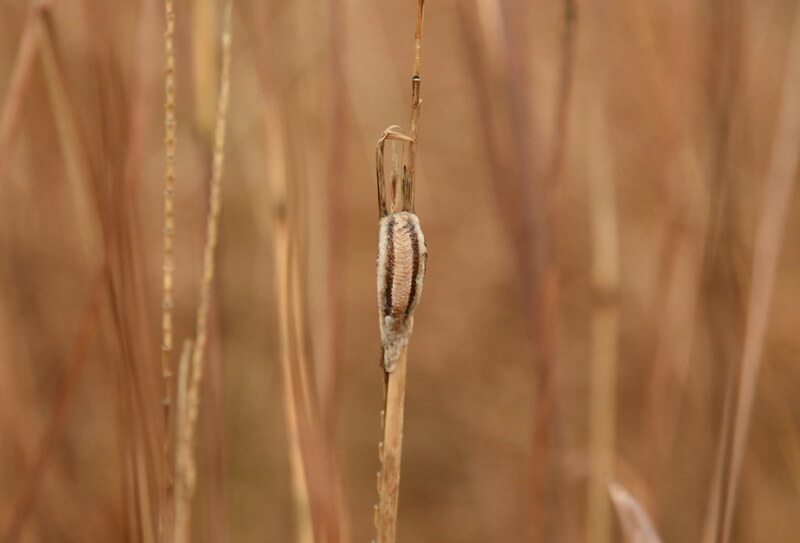 On a rainy February day, I took a walk through the Native Flora Garden, enjoying the rich colors and textures of the tall grass prairie, left to stand during the winter months. I didn’t expect to see many obvious signs of insect life. As ectotherms, insects can’t generate enough heat to stay active in the cold, so they have burrowed into the ground, hidden themselves under bark, or even migrated south. But one type of insect was easy to spot on this day: the praying mantis. This is the ootheca, or egg case, laid by a Carolina mantis (Stagmomantis carolina), containing around 200 eggs. They’re abundant and relatively easy to spot this time of year. Female mantids will deposit their eggs on twigs, sturdy grass stems, or hard surfaces and coat them with a foamy secretion that hardens and protects the eggs until they’re ready to hatch. Adults don’t survive the winter. Males, in fact, often don’t survive the mating process, since females will readily cannibalize them after or even during mating. The Chinese mantis (Tenodera sinensis) lays a larger, rounder ootheca, often wrapped around a twig like this one on a sweet fern in the Native Flora Garden. This species is was introduced accidentally to North American around the turn of the last century. I’ve seen many Chinese mantises at Brooklyn Botanic Garden but never a Carolina mantis. Hopefully, the abundance of oothecae from the native species means I’ll find some adults later this year. It’s pretty easy to tell the two apart because Chinese mantises have distinct vertical stripes between their eyes and Carolina mantises do not. 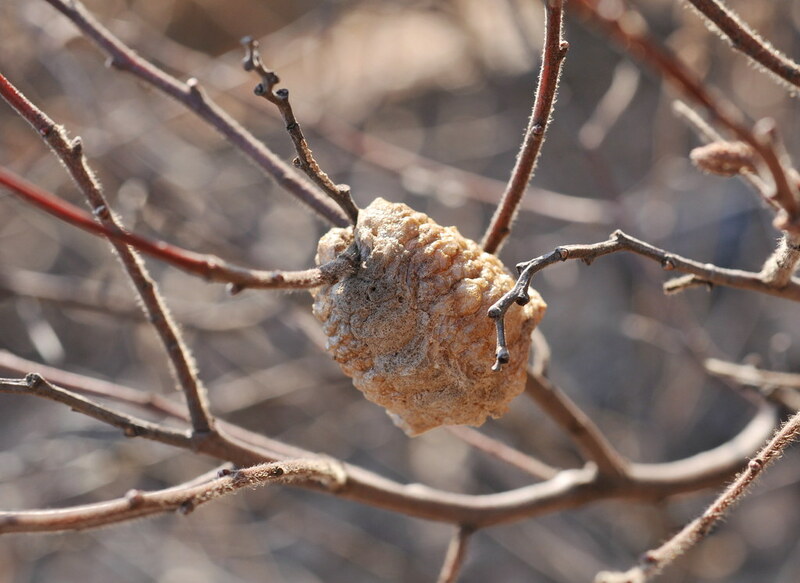 Sometime in spring or early summer, tiny swarms of mantis nymphs will emerge from these egg cases. They’re voracious predators at birth and will prey on their siblings. This little survivor was among many I found in the Monocot Border in June. Praying mantises—like cockroaches, which are closely related, and grasshoppers, which are more distantly so—are hemimetabolous. That means they never go through a larval or pupal stage. Instead, they hatch as miniature versions of adults and will simply molt several times until they become an imago, the final, adult stage. 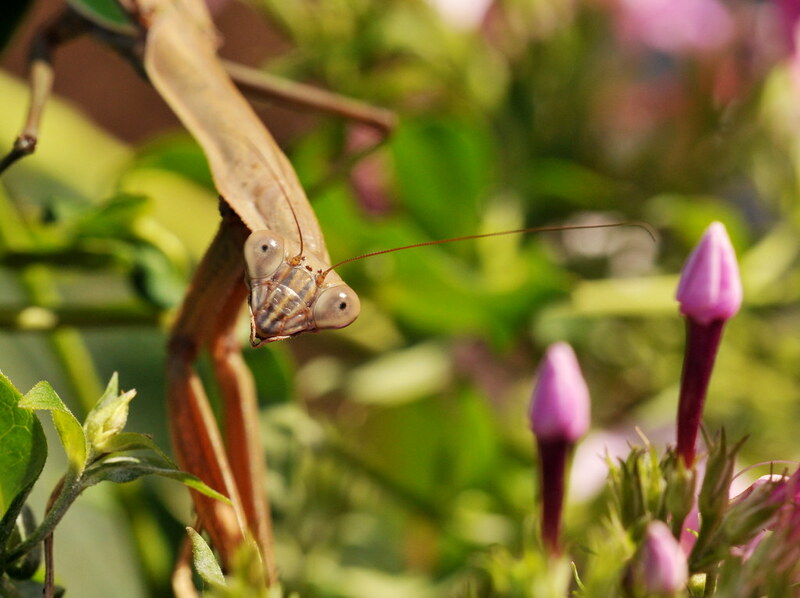 Praying mantises generally do not stalk prey. Instead they wait for a suitable target to approach. When the prey is in range, the mantis lashes out with its forelegs and grabs it. Its forelegs are well adapted for this: large, thick, and covered with spines that help trap prey. When not grappling with a meal, the insect's forelegs are folded up in a manner that suggests its common name. 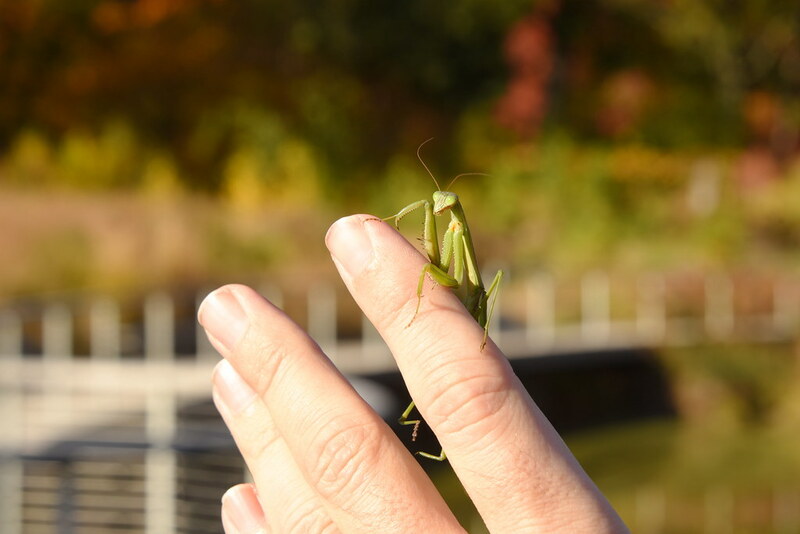 Despite its predatory nature, the praying mantis is usually slow moving and can be gently handled. I picked this Chinese mantis off a blade of grass in the fall, took a few photos, and returned it to the foliage. Like the dragonflies I wrote about in an earlier entry, mantids rely on their exceptional vision to track prey and other predators. They are able rotate their heads much more freely than most other insects, and I find they will almost always track my camera lens as I photograph them, as this one at Lily Pool Terrace did. The disconcerting feeling of being stared down by an insect is amplified by the mantis's pseudopupils, which make it appear to be making eye contact. Unlike our pupils, the pseudopupil consists of thousands of long, narrow ommatidia—units of cell clusters made up of photoreceptor and other cells—that make up compound eyes. More: Read about the American woodcock, a funny-looking bird with a strange mating ritual. Mantids' eyes will also change color depending on the light, becoming lighter during the day and very dark at night. Their widely spaced eyes provide excellent stereoscopic vision, allowing them to accurately gauge the distance to their prey. 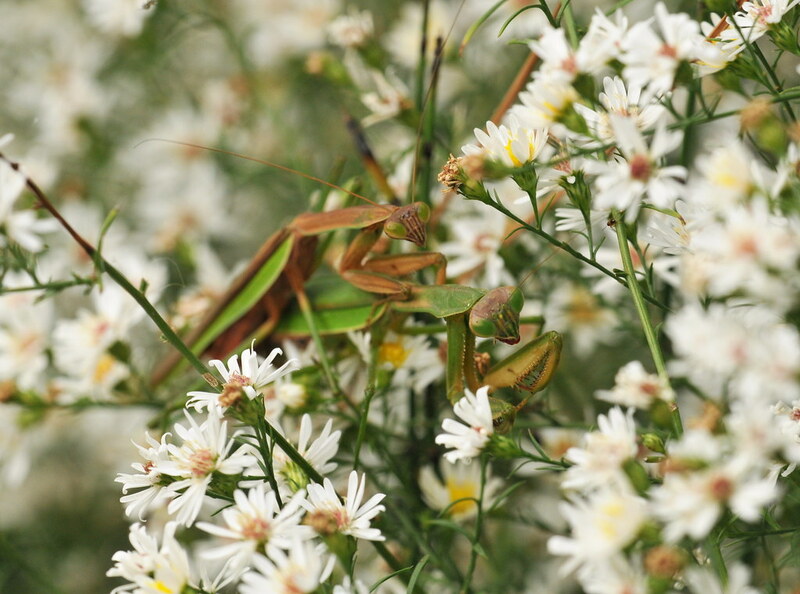 I found this pair of Chinese mantises in the Japanese Hill-and-Pond Garden in October. It’s probably a mating couple, with the smaller male on top. Mantis coloration can vary greatly between individuals and even between molts of a single mantis. Chinese mantises can be anywhere from pale brown to deep green, depending on their environment. The All About Bugs series gives close-up looks at local insects and other tiny invertebrates. Steven N. Severinghaus is a photographer, programmer, and nature lover living in Brooklyn. He has contributed to a number of photographic projects at Brooklyn Botanic Garden, including the 2015 calendar, and is a volunteer photographer at the High Line. You can follow his photography at Flickr, Instagram, and Twitter. The egg case of Carolina mantis (Stagmomantis carolina) in the Native Flora Garden. Photo by Steven Severinghaus. Chinese mantis adult in the Native Flora Garden. Photo by Steven Severinghaus. 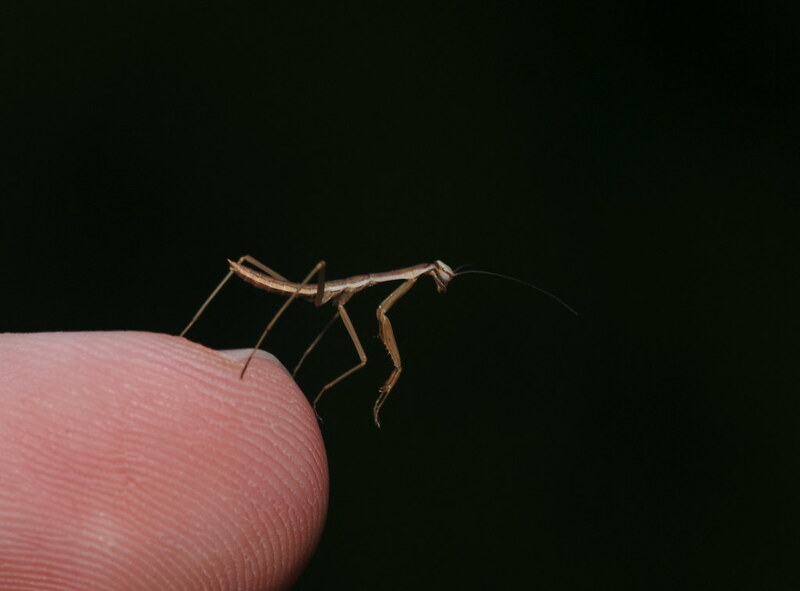 Chinese mantis (Tenodera sinensis) nymph. Photo by Steven Severinghaus. A Chinese mantis. Note the stripe between the eyes. Photo by Steven Severinghaus. The egg case of a Chinese mantis (Tenodera sinensis). Photo by Steven Severinghaus. Chinese mantises pair. Photo by Steven Severinghaus.